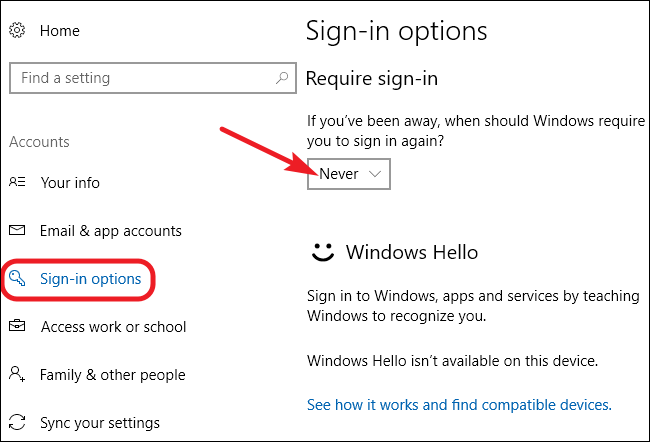 If you’ve configured Windows to automatically log you in rather than having to enter a password, you might find it annoying that you still need to enter a password when your PC comes out of sleep mode. Here’s the fix. In Windows 10, you’ll need to head in the “Settings” app to make this change. 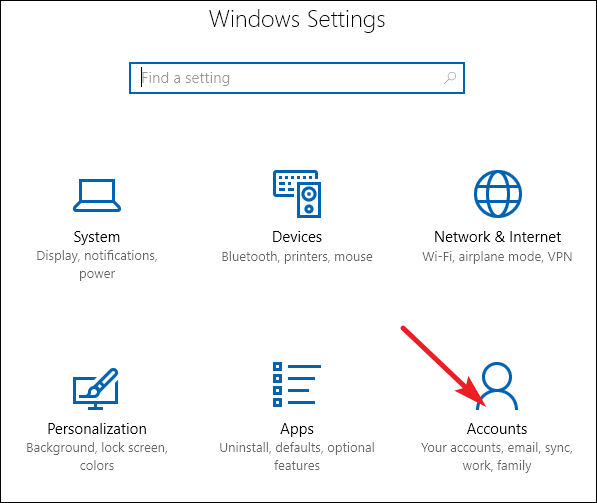 Just hit Windows+I to bring it up and then click the “Accounts” option. On the “Accounts” page, switch to the “Sign-in options” tab, and then select “Never” from the “Require sign-in” dropdown menu. Despite the somewhat confusing wording of this option, this only removes the password requirement when Windows wakes from sleep. You’ll still be asked to sign in if you restart, sign out of, or lock your PC. 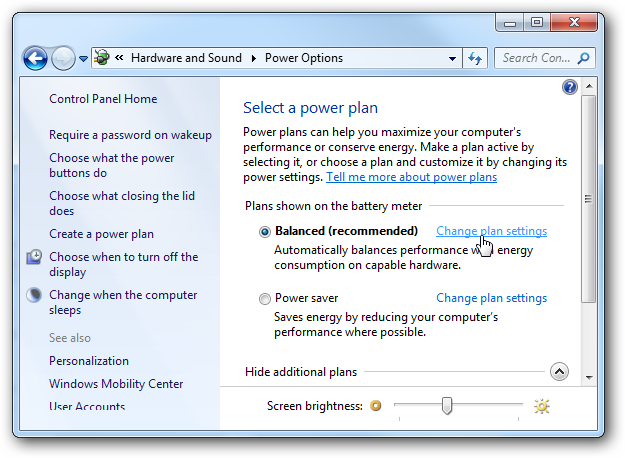 If you’re running Windows 7 or 8, you’ll need to head into the “Power Options” Control Panel app. Hit Start, type “power options,” and then hit Enter. 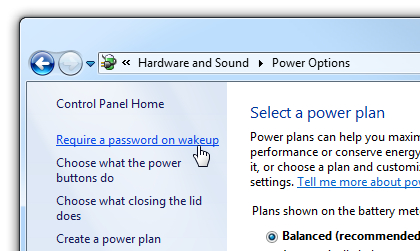 In the “Power Options” window, click the “Require a password on wakeup” link on the left-hand side. In the “System Settings” window, click the “Change settings that are currently unavailable” link. At the bottom of the next window, select the “Don’t require a password” option, and then click the “Save Changes” button. From there, click “Sign-in options” on the left-hand side to get to the security options. Click the “Change” button in the “Password Policy” section. Clicking the Change button will allow you to stop requiring a password. 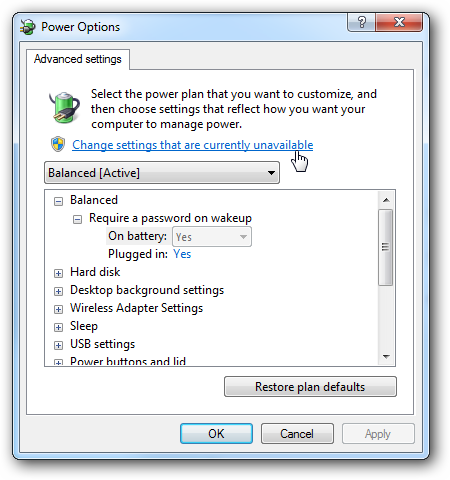 In Windows Vista, you’ll need to head into the “Power Options” Control Panel app, find the power plan you’re using, and then click the “Change plan settings” link. 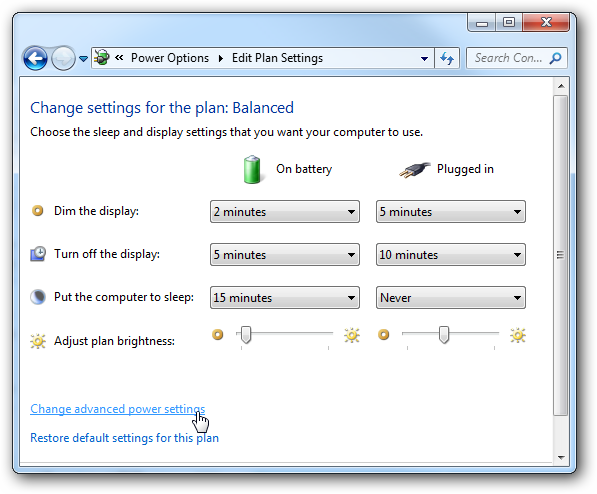 On the “Edit Plan Settigs” screen, click the “Change advanced power settings” link at the bottom. In the “Power Options” dialog box, click the “Change settings that are currently unavailable” link. Expand the “Balanced” category, and then expand the “Require a password on wakeup” category. 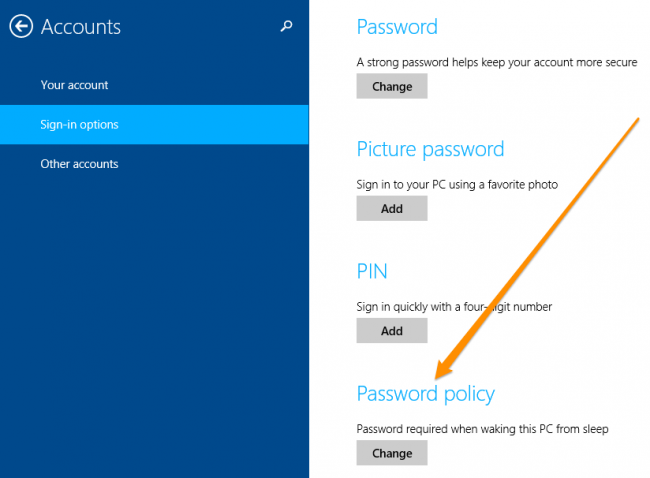 You can change the password requirement for when you’re running on battery and when your PC is plugged in. 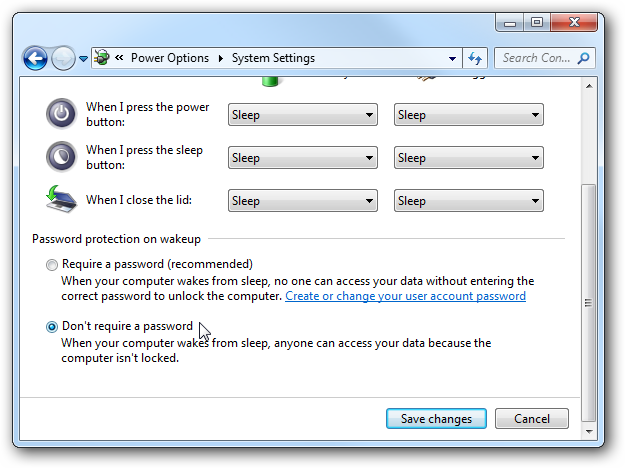 Make sure to set both options to “No” if you don’t want to be bothered entering a password on wakeup at all. 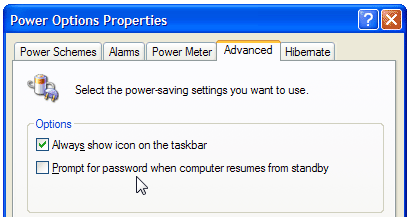 In Windows XP, the process is a little simpler than in Vista—just head into the “Power Options” Control Panel app find the Advanced tab, and then disable the “Prompt for password when computer resumes from standby” option. 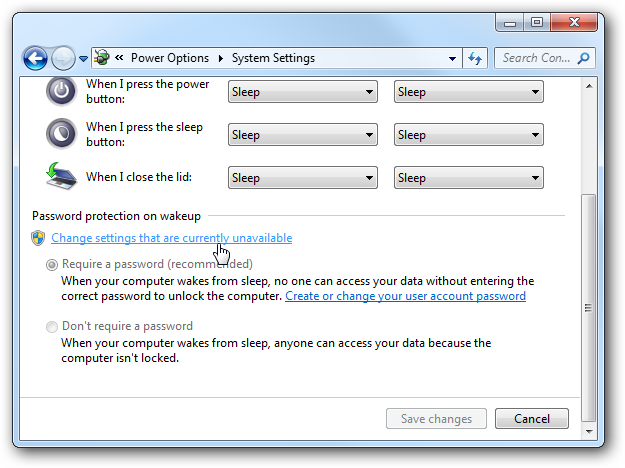 And now you should be free from having to type your password every time your PC wakes from sleep.